The Australian podcast for teachers the bridges the gap between research, policy and practice. Join the Teachers’ Brains Trust! The Teachers’ Brains Trust is the part of our show that’s dedicated to you, and every member of the Teachers’ Education Review community. We’d love to hear from teachers who have a teaching strategy to share, a question to ask, or who can help others find the information they’re looking for. That’s what the Teachers’ Brains Trust is all about! If you have a teaching strategy to share, or if you’re holding a TeachMeet or similar event and would like to share recordings of some of the presentations, contact us at info@terpodcast.com for guidelines on how to go about it. Be sure to put Teachers’ Brains Trust as the subject line. 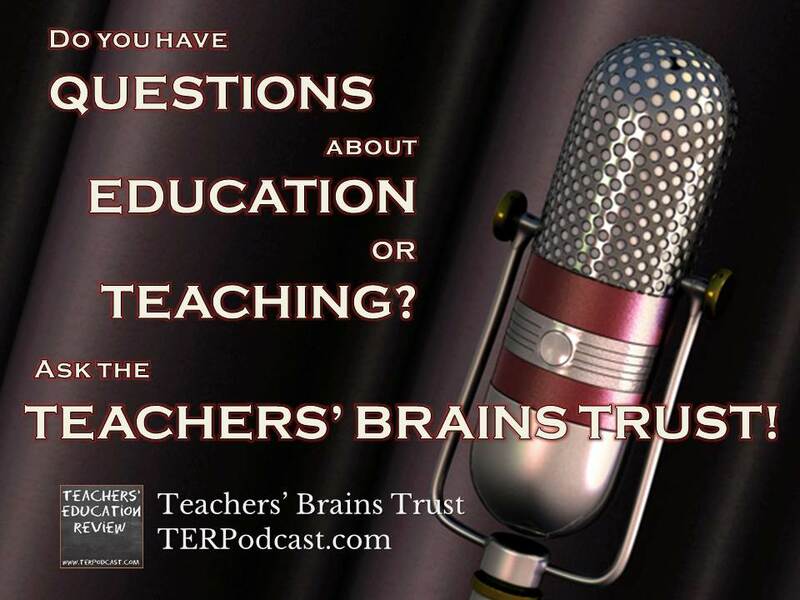 Email: Send your questions to info@terpodcast.com with Teachers’ Brains Trust in the subject line. Voice Message: You can record your question and send it to us to be played as part of a future episode. You can record your question using your own computer to record and send the final MP3 to the email address above. Alternatively you can CLICK HERE to use our online voice mail service, using you computer’s microphone to record your question. Finally, you can leave a traditional voice mail by calling +61 2 8003 4837 or looking up ter.podcast on Skype. If you would like to help answer others’ questions: As we receive questions for the Teachers’ Brains Trust they will be posted on a dedicated page, and you will be able to respond to any question you choose with links and contact details provided on the page. We look forward to hearing more from our listeners and including your ideas and information into future episodes of the TER Podcast. Please Note: All submissions to the TER Podcast are subject to approval before being incorporated into an episode of the podcast. By submitting a recording or voice mail, you give TER Podcast unrestricted rights to edit and broadcast that recording as part of the Teacher’s Brains trust and Teachers’ Education Review. Image: “That old time radio microphone” by Mackingster. Used and edited under Creative Commons 3.0. Ep 19 Update: With apologies to @DavidPriceOBE … and everyone else. We know that our audience has high expectations of the show we put out every fortnight, and for good reason! We’re freakin’ fantastic. But, we’re not too awesome to admit that sometimes we make mistakes. Well, Cameron makes mistakes. Corinne hasn’t admitted to any as yet. We’re excited to announce some additional content at our TER Live: BYOD Policy Forum on March 25. Currently visitng Australia from the U.S., Jim Sill and Ken Shelton, two of Google’s ‘Apps Aficionados’, will be attending the forum, and will be joining the forum to discuss apps in education. We will be cutting a few minutes of the planned 60 for BYOD, and extending the forum by 10 minutes in order to give Jim and Ken up to 20 minutes to discuss apps and answer questions. There’s already a good crowd signed up, with over 20 people planning to stick around after for dinner, so if you’d like to come and talk tech in education with like-minded teachers, click here for full details and registration. After almost a decade in the video and television industry, Jim Sill hung up his producer hat and embarked on a career in education. Using his industry experience, he created an award winning video production program at El Diamante High School in Visalia, CA. By involving students in real world video projects, they garnered awards and recognition at the local, state, and national level. With experience producing local television and industrial videos for non-profit organizations, many of his former students now work in the industry. As a Google Certified Teacher, Apple Distinguished Educator, Google Apps Certified Trainer and Apple Certified Trainer, Jim travels the world leading professional development workshops on topics that include Using Video for Social Change, Cinematic Narrative Techniques, Encouraging a Creative Student, Google in the Classroom and much more. Today, Jim is an Educational Technology Consultant and works with educators around the world. 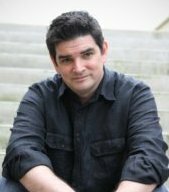 In 2012, Jim was featured on Edutopia and their Teach2Learn series for his work in Building Career Skills in Video Production. He was also awarded The Computer Using Educator (CUE) Outstanding Teacher Award in 2009 and nominated for the International Society for Technology in Education (ISTE) Outstanding Teacher Award. Ken currently holds a M.A. in Education, with a specialization in New Media Design and Production and is a lead learner on the Google Teacher Academy. He has worked as an educator for 9 years and currently teaches technology at the Middle School level. As a part of his active involvement within the Educational Technology community, Ken is a Google Certified Teacher, an Apple Distinguished Educator, a Discovery STAR Educator, and a member of the Discovery Educator Network California Leadership Council. Ken was also recently appointed to the California Superintendent of Public Instruction’s Educational Technology Task Force. Ken regularly gives presentations and leads workshops, many of which are hands on, covering a wide variety of educational technology, technology integration, creative expression, and instructional design topics. In Episode 5 of TER Podcast we discussed Connected Learning, and outlined some of the benefits and risks associated with increased use of online connectivity and social media in education. As a follow up to that episode, here are some suggested ways that teachers can get more connected with others in their profession, or help get their students connected with the each other and the world beyond the classroom. Please note: While some of these sites incorporate commercial services, this post is not sponsored in any way, nor a direct endorsement of those services, this is just a list of tools that some teachers have found useful in the classroom and in their own professional development. The Teachers’ Education Review is a new podcast created and produced by teachers in Australian schools. This podcast reviews educational issues with a particular focus on the implications on classroom teaching and learning activities. Episodes will be released monthly, giving an overview of local, national an international issues in education before exploring 1-2 issues in greater depth through a panel discussion with experienced educators. Episode 1, July 2013, will be released shortly! We welcome suggestions for future episodes, and feedback and comments can be posted here, or emailed to TERPodcast@gmail.com.